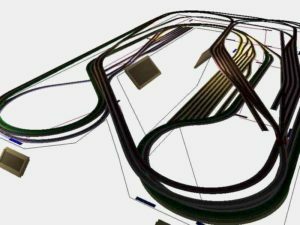 3rd Planit from El Dorado software has a number of features that, in my opinion, make this an outstanding software tool for the model railroader. I have used it extensively on my layout and continue to find new ways to use it. For those of you who are curious, here is a 3D view of the shop HO layout. For those of you that already have 3rd Planit and want to see some of the ways that we use it, send me an e-mail and I will send you the 3pi file.